Celaena Sardothien is the assassin with everything: a place to call her own, the love of handsome Sam, and, best of all, freedom. But Celaena won’t be truly free until she is far away from her old master, Arobynn Hamel – so she and Sam decide to take one last daring assignment that will liberate them forever. And that’s how Celaena learns that having everything… means everything can be taken away. I love epic fantasies because it's rich in imagination and very unique as it's usually set in a different world altogether. The thought that goes into writing a good fantasy is boundless and when translated into paper right, one can't help but get sucked into the world the author created. 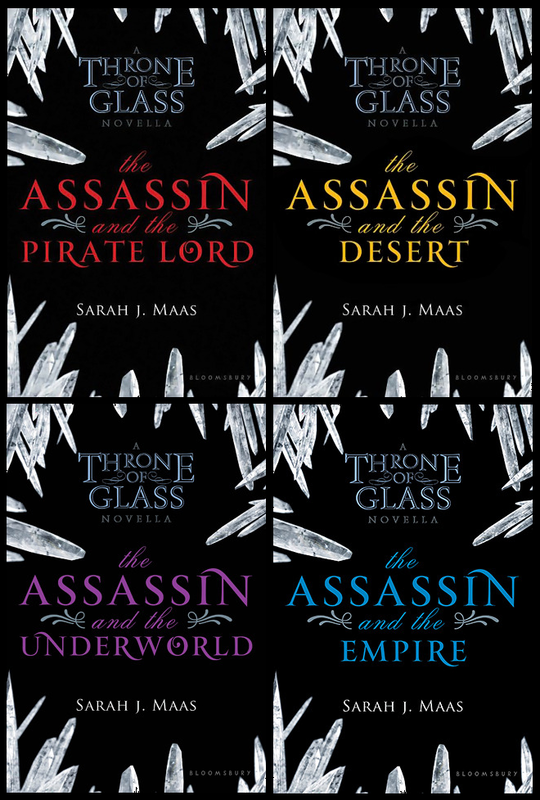 Throne of Glass by Sarah J. Maas is exactly this and so much more, I have to restrain myself from feasting on her series in one sitting lest I might miss something because of the heart pounding excitement it brought me. I delved on the novellas first before jumping in to the novel itself, I usually find it hard to get acclimated to fantasy novels because of all the jargon, hard to pronounce names and out of this world places that fantasy writers are fond of doing. These four novellas did that job perfectly for me, it gave me a feel of Celaena Sardothien's world, her reputation and the people around her that by the end of the fourth novella, I was having bloodlust over some of the characters for betraying my now favorite assassin. But let me take you through the prequels briefly before I fangirl over the novel itself in case you haven't read these yet. In THE ASSASSIN AND THE PIRATE LORD we are fairly introduced to Celaena, Arobynn Hamel and Sam Cortland, the key players that shaped and continued to shape Celaena throughout the story until the novel itself. Here Celaena and Sam were sent on a mission to bring slaves for Arobynn which the two failed to complete earning them Arobynn's fury because though Celaena can kill you in cold blood and bathe in it after, her vulnerability lies in her humanity. Celaena feels strongly against slavery and even if she knew that Arobynn will go livid, she went ahead and freed the slaves, jeopardizing her and Sam's position in the Guild. Their disobedience didn't sit well with her mentor and King of Assassins, Arobynn, and after beating her and Sam to a pulp, he sent Celaena to the Red Desert to train with the Silent Assassins. It's in THE ASSASSIN AND THE DESERT that we see the other side of Celaena, she's vain with a penchant for fine and luxurious things. It is here that her relationship with Arobynn started to crack and though her mission and training was fruitful, enabling her to pay off her debt to Arobynn, she's far from being free from his clutches and the Guild's. 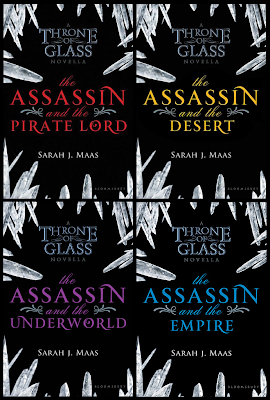 My favorite has to be THE ASSASSIN AND THE UNDERWORLD because it is here that Celaena and Sam's love story began to unfold. The tension between these two has been evident from the start but it is here where it became tightly coiled until it uncurled into this wonderful and touching romance. This volume was truly a love story more than anything else but we also get a sense that Sam and Celaena's chances for HEA are grim. SJMaas tortured us for 96 pages, giving us false hopes that maybe, even if it's a long shot, Sam and Celaena will be victorious. Apparently the cost for that HEA is steep because Sam and Celaena's world shattered in novella 4. THE ASSASSIN AND THE EMPIRE is where we get our hearts broken, it is here that our heroine was forced to grow up, her positive disposition is blighted by Arobynn's betrayal and Sam's death (no spoiler here since Throne of Glass' synopsis is telling), striking any hope for happiness and freedom. SJMaas gave us the absolute ending to innocence and the perfect beginning to a life set in bloodlust, grief and revenge which had me all psyched and hyped for Throne of Glass. She didn't want to go out into a world where he (Sam) didn't exist. So she watched the light shift and change, and let the world pass by without her.